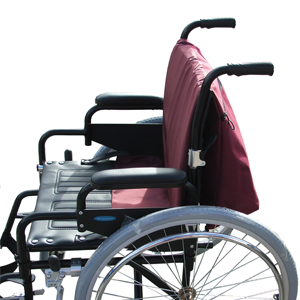 This combination of back cushion and shopping holdall is an ideal comfort accessory for any wheelchair. This combination of back cushion and shopping holdall is an ideal comfort accessory for any wheelchair. The back cushion with extended seat flap will keep you comfortable and prevent draughts. The large holdall will hold most things that you would wish to carry. It is available in a choice of Royal Blue, Grey or Maroon.